DataTravelerÂ® 50 is a lightweight USB Flash drive available in capacities from 8GB to 128GB*. The driveâ€™s compact, capless design features a metal casing that complements any compatible device and colorful accents that range by drive capacity. Fast** USB 3.1 Gen 1 (USB 3.0)*** performance ensures data transfer of music, video and more is quick and easy. Backward compatible with existing USB 2.0 ports for convenience, the drive is also customizable with your logo and/or digital files. 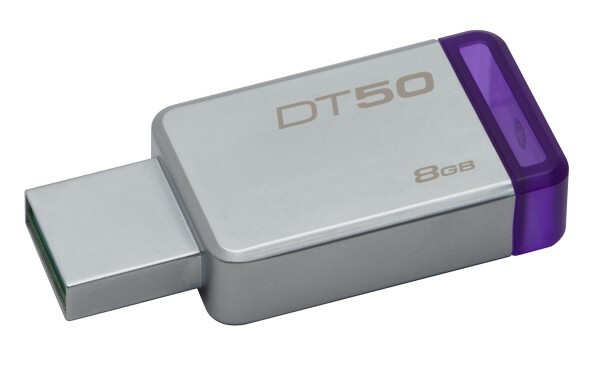 **** DT 50 is backed by a five-year warranty, free technical support and legendary KingstonÂ® reliability. * Some of the listed capacity on a Flash storage device is used for formatting and other functions and thus is not available for data storage. As such, the actual available capacity for data storage is less than what is listed on the products. For more information, go to Kingstonâ€™s Flash Memory Guide at kingston.com/flashguide.